Bureaucratic incompetence and indifference is robbing India of a proper understanding of its military history. The compilation of war histories from the 1962, 1965 and 1971 operations by the Indian Armed Forces is undertaken by historians at the behest of the Defence Ministry’s History Division. Yet despite this fact, sections of the civilian bureaucracy continue to obstruct publication of these documents. One reason is that the headquarters and units of the Indian Armed Forces don’t always adhere to the procedures laid down for the declassification of documents, which means they aren’t available for historical study. This problem has been further compounded by the indifference of the post-independence political leadership toward matters military. 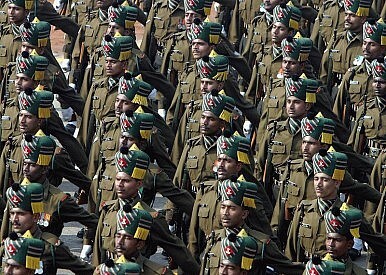 During World War I, nearly 1.2 million Indians were recruited for service in the British Indian Army. When the war ended, about 950,000 Indian troops were serving overseas. According to some official estimates, between 62,000 and 65,000 Indian soldiers were killed in that war. In World War II, the Indian Army saw action on fronts ranging from Italy and North Africa to East Africa, the Middle East and the Far East. In Southeast Asia alone, 700,000 Indian troops joined the effort to oust Japanese armies from Burma, Malaya and Indo-China. By the time the war ended, the Indian Army numbered a massive 2.5 million men, the largest all-volunteer force the world had ever seen. The irony today, though, is that it isn’t just foreigners who are unaware of this British-era Indian military legacy – India’s own post-colonial political class and civilian bureaucracy seem to have deliberately induced a collective national amnesia about the country’s rich pre-independence military traditions. Indeed, the Indian foreign policy establishment still largely pretends that India’s engagement with the world began on August 15, 1947. A lack of consciousness about military history is evident from reports about the alleged ‘wilful’ destruction of documents pertaining to the 1971 operations at Headquarters Eastern Command in Kolkata. While the facts remain unclear, if my experience in the Army is any guide, it could well simply be a case of incompetence or negligence. All of us who have served in the Indian Armed Forces are aware that every five years, boards of officers are convened to review old files and documents and destroy those that are no longer relevant (it’s a practice followed due to lack of storage space, rather than anything else). Most members of such boards are aware neither of the historical value of these documents, nor of the rule that upon declassification, documents of historical value are to be transferred to the national archives. Instead, such records are being destroyed by burning. Sadly, this means historical memory, including of the sacrifices made by the country’s armed forces, goes unrecorded—destroyed by mindless adherence to bureaucratic procedure. It could be this country’s inability to honestly record history that partly contributed to the controversy last year over the judgment by the Armed Forces Tribunal ordering a re-writing of operations of the Kargil war. While this was an embarrassment for the Army, on the positive side, it showed that corrective mechanisms are in place. It’s also important to note that the operational record isn’t the official history of the war – it’s a compilation of the events by the operational staff at Army Headquarters. The compilation of an official history of the Kargil operation will no doubt be undertaken when the government formally commissions a historian to do so. We can only hope this is done while the participants of that campaign are still alive – this would be the best way to honour the sacrifices made by our soldiers. Still, given past experience, such a history – even if written – is unlikely to see the light of day in the near future. The publication of war histories—a recommendation of both the Kargil Review Committee and the Group of Ministers Report – seems to have been held up due to lethargy and bureaucratic indifference. The histories of the 1962 and 1965 wars compiled by the Historical Section were referred for comments to the Military Operations Directorate when I was in that organization, initially as the Additional Director General and then as Director General. I distinctly recall that we cleared both histories for publication without any caveats whatsoever. In late 2001, I was nominated as a member of a committee set up by the Defence Ministry to examine the 1962, 1965 and 1971 war histories and make recommendations on whether these should be published. The chairman of the committee was N.N. Vohra (presently governor of Jammu & Kashmir) and the other member was the former head of the Historical Section, namely S. N. Prasad. The committee studied the three documents in great detail, as well as comments submitted by various organs of the government, including the External Affairs Ministry, the three service headquarters and intelligence organisations, among others. In mid-2002, after concluding that there was no case for withholding the histories from the public domain, the committee recommended that they be released for publication. Yet little appears to have happened for the next couple of years, after which the Centre for Armed Forces Historical Research was asked to review the histories for factual correctness and editing. This was done with the help of senior service members with established credentials and personal knowledge of the operations, and the histories were resubmitted with the recommendation that they be published. Unfortunately, the war histories are still under wraps. It appears that the political leadership doesn’t have the time or inclination to attend to such mundane aspects as military history. And the civilian bureaucracy that has a stranglehold on administration, yet which lacks real accountability, is single-minded in its determination to deprive the Armed Forces of any credit for their contribution to national security and cohesion. The only way this stranglehold can be broken is by civil society in general, and the strategic community in particular, raising their voices for the release into the public domain of documents covering the security of our country. Lt Gen. Satish Nambiar is a Distinguished Fellow at the Institute for Defence Studies and Analyses, New Delhi. This is an edited version of an article that originally appearedhere.